Each winter I spend time reading books for children and young adults, preparing for the coming summer so that I can, with confidence, personally recommend books to my young customers that I am sure they will enjoy reading. I was very pleased to see that Shane Peacock’s book The Mystery of Ireland’s Eye has been re-issued. Written in 1999 The Mystery of Ireland’s Eye is the first in what became the Dylan Maples Adventure series. An ideal series of books for boys aged 10 to 13 or so. Ireland’s Eye is an island off the south coast of Newfoundland, settled in 1600s and now abandoned after the families were forced to move in 1965 when so many isolated communities were “re-settled” by the government. Dylan Maples is an only child, his parents an adventurous couple, a lawyer and a schoolteacher. Dylan is a typical young teenager, a hockey player, and a skateboarder. The family lives in an affluent Toronto neigbourhood and spends summers at their cottage north of the city. Dylan’s father is a keen swimmer and kayaker and, as the novel opens, he is beginning to plan a trip to Newfoundland, to a popular kayaking destination, Ireland’s Eye. Overhearing the plan, and captivated by the idea of visiting a Ghost town, Dylan decides he will prove to his father that he has the skills needed go along on this trip, which he does. And off they go, Mom and Dad, and Dylan heading into much more of an adventure than they could every have imagined. 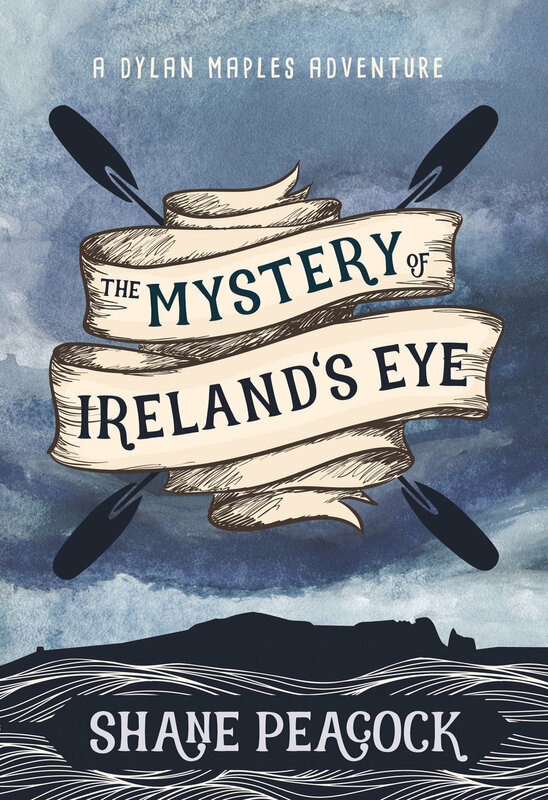 The Mystery of Ireland’s Eye is a very suspenseful adventure, with plenty of thrilling challenges both on the water and at the hands of some very bad men. These men have nefarious reasons for being on Ireland’s Eye and the Maples family land right in the middle of serious trouble. Of course, all ends well and young readers can read on in the series as Dylan has many more adventures. Flame and Ashes by Janet McNaughton is one of the Dear Canada series, novels about Canadian history seen through the eyes of girls and young women. This edition is The Great Fire Diary of Triffie Winsor in St. John’s Newfoundland, in 1892. We meet Tryphena “Triffie” Winsor on an early summer day. She is one of three children, her parents affluent merchants in the city of St. John’s. Her younger brother, Alfie, is her best friend and companion and Sarah is a beloved sister and a well brought up young lady. Triffie herself is an imaginative girl, and one who finds it difficult to sit still and settle to a task. It is suggested that she keep a diary, and as Triffie herself is set on self-improvement she is excited at the idea of writing about her daily experiences. Her diary begins with the day-to-day life of the family at home, but when the Great Fire of 1892 destroys much of downtown St. John’s, including this family’s home and business premises. The Winsor family is wealthy compared to most, they have assets that allow them to reestablish their business, and to help others to rebuilt their lives after losing most everything they owned, as Triffie records it all in her diary. I think this particular novel will appeal to girls of about 8 to 12 years old who enjoyed reading Anne of Green Gables and The Secret Garden. It is richly old fashioned in it’s language, and the events as described portray a fascinating time and place, and a way of life that is long gone.